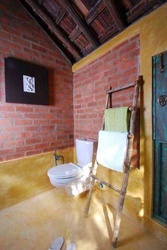 The bathroom may be the smallest room in the house , but nevertheless the is of utmost importance. 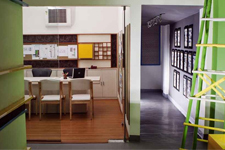 Firstly , the construction of the bathroom may be such that it is spacious and not congested. The location of a bathroom must be such that it is accessible by all. 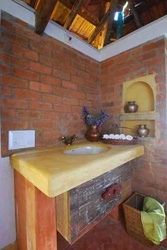 There can obviously be more than one bathroom in the house , which will be more comfortable as well. 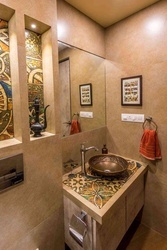 Every washroom must certainly have a washbasin accompanied by huge mirror, a toilet and either a shower enclosure or a bathtub whichever is suitable. Other accessories that could be a part of the room are a dustbin , a magazine or book shelf , towel rack , laundry basket etc. 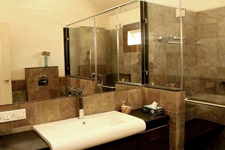 Bathrooms are usually either in shades of brown or colored in lighter shades of cream , lavender and white. Here are some great-looking bathroom designs. Have a look and if you ike them, do not hesitate to add them to your Zingy Boards!